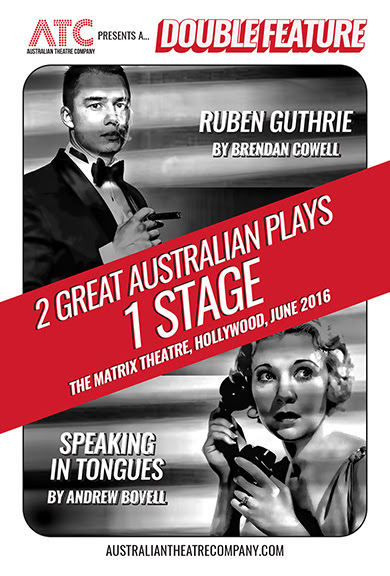 The Matrix Theatre will present a mini Australian theater festival in June, when L.A.’s Australian Theatre Company presents a ‘Double Feature’ of two celebrated Australian plays that were made into movies and ATC’s second annual free reading series - all over the course of 3-1/2 weeks. Kicking things off on Monday, June 6 at 8 p.m. is Andrew Bovell’s noir psychological thriller, Speaking in Tongues. Two couples set out to betray their partners… a lover returns from the past… a husband doesn’t answer the phone… and a neighbor is the prime suspect when a woman disappears. Brendan Cowell’s Ruben Guthrie, opening on Tuesday, June 7, takes an affecting and darkly comic look at alcoholism and the impact of Australia’s drinking culture. A Sydney adman who spirals high, then crashes hard, it’s the story not only of his battle with the bottle — but also of the city that won't let him put it down. Speaking in Tongues and Ruben Guthrie run June 6 through June 28, alternating performances on Mondays at 8 p.m.; Tuesdays at 8 p.m.; Thursdays at 8 p.m.; Fridays at 8 p.m.; Saturdays at 4 p.m. and 8 p.m.; andSundays at 3 p.m. and 7 p.m. The Works by Women free reading series takes place on Wednesdays at 8 p.m.Please scroll down for a complete schedule of performances. For reservations and information, call (323) 960-4443 or go to www.AustralianTheatreCompany.com.